At this point I question if there’s even a point to me sitting down and taking time out of my day to write a review of a new Kevin Hart movie. I mean, unless Hart decides to work outside his comfort zone with a director that might challenge him or unless he’s part of an ensemble cast one pretty much knows what they’re getting from a Kevin Hart comedy, right? Given Night School is the first production to be released under Hart’s own production company though one can safely assume that if this is successful-which all signs point to why wouldn’t it be?-that the general viewing public can expect more of this same, middle-of-the-road comedy with recycled premises and recycled jokes that hold Hart at the center as a character who must overcome something in order to realize something about himself...while being made fun of for being short, of course. That said, I appreciate and kind of admire Hart for always willing to be the brunt of the joke and despite Night School being a rather large missed opportunity given it pairs the immensely charming and infinitely likable Hart with Girls Trip breakout Tiffany Haddish and her director on that film, Malcolm D. Lee (who’s also made The Best Man films and the most recent Barbershop picture), there is still enough here for it to qualify as an entertaining enough time at the movies. No, that’s not necessarily a ringing endorsement, but it does mean this doesn’t feel wholly like a cheap, quickly manufactured product with little effort put in and therefore little expectations held for it. In fact, it’s actually the opposite in that it’s not hard to see Hart, his co-stars, and his company are genuinely trying to make something with, well...heart. Does this mean it actually holds some weight? Not really and it isn’t as consistently funny enough given the stars of the film, but this is a rare comedy that doesn’t have an ugly side to it. It’s an optimistic comedy, if you will, whereas the majority of big studio comedies tend to be both cynical and egotistical Night School sets itself apart from the pack if not for being the funniest of the year, but for holding out the most hope in humanity and seeing the good in the resilience of the human spirit. Not exactly an easy thing to do these days. 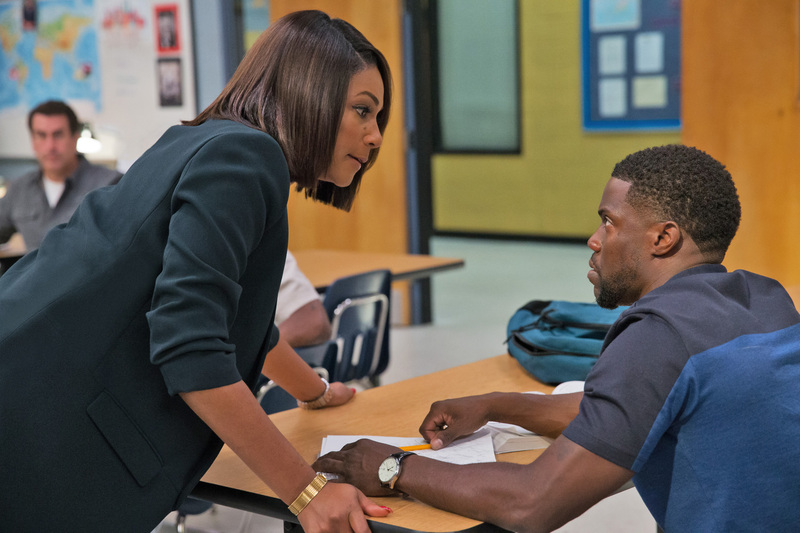 Carrie (Tiffany Haddish) schools Teddy (Kevin Hart) after he tries to smooth talk his way through night school. In Night School, Hart plays Theodore AKA Teddy Walker. Teddy is a guy who goes back to get his GED after dropping out of high school in order to get the kind of job he thinks he needs to keep his fiancée. At the titular night school, Haddish is the no-nonsense teacher, Carrie, with Hart being joined by a solid ensemble cast of fellow comedians that includes stand-outs like The 40-Year-Old Virgin's Romany Malco as Jaylen, a conspiracy theorist who fears the inevitable takeover of machines, and The Hangover and 21 Jump Street alum Rob Riggle who is Mackenzie, a dense-dad that's worked hard labor jobs for thirty-plus years and is now going back to get his GED as a way to bargain with his young son to stay in school and get his diploma. Mary Lynn Rajskub (Brooklyn Nine-Nine and It's Always Sunny) also stars as a stay at home mom who dropped out of high school when she became pregnant with she and her now husband's (Owen Harn) first child who has to now actively convince herself she loves her family in order to keep her sanity and who is hoping to find some outlet outside the home. The Daily Show's Al Madrigal also shows up as an immigrant aspiring to be a pop star/dental hygienist after having lost his previous job as a waiter at an upscale restaurant due to a dispute with none other than Teddy. Rounding out the class is the younger Mila (Anne Winters of 13 Reasons Why) who is solely in attendance to avoid having to go to juvy as well as an incarcerated convict named Bobby as played by rapper Fat Joe. SNL's Taran Killam is Teddy's former high school nemesis turned principal of their alma mater where Teddy is attending the titular night school which only leads to complications and hijinks as these things do. To complicate things further, Teddy also decides to try and hide the fact that he is going back to school from fiancée Lisa (Megalyn Echikunwoke) for no other reason than to keep up the facade he's concocted despite having blown-up his place of business on the night he asked Lisa to marry him. Granted, the movie communicates that Lisa understands Teddy is now on the hunt for a new job and that she doesn't realize he's a high school dropout, but this all feels twisted solely for the sake of conflict and making the audience doubt the authenticity of the relationship further more than it does a natural conclusion of Teddy's unfortunate circumstances. Teddy does have real prospects though as longtime best friend Marvin (Ben Schwartz of Parks and Rec) promises to hook Teddy up with a financial analyzer position where he works once Teddy has his degree. Until Teddy passes the GED exam though, he resorts to working at a fast-food chain based around selling Christian chicken and living with his parents (Keith David and Donna Biscoe). Night School's greatest strength is in fact that it is so well-intentioned meaning that it makes up for its lack of consistent laughs with a general overall vibe that makes you want to forgive it for not fully delivering the goods. 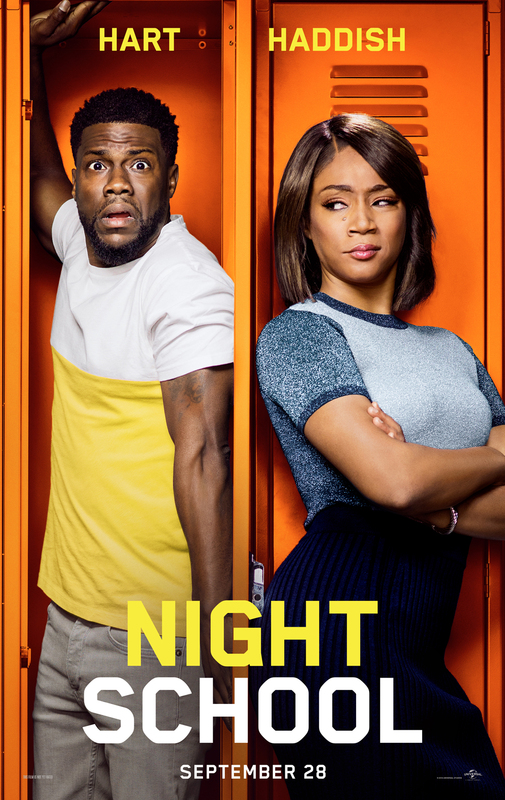 Should Night School have aspired to be more considering it teamed a megastar of comedy at the moment, Mr. Hart, with the hottest rising star in comedy right now AKA Ms. Haddish? Definitely, but as has been discussed many times over the last several months: to loft one's expectations onto a film rather than accepting the film for what it is can only lead to bad things and big disappointments. And so, while Night School may benefit from this forgiveness of sorts it isn't afforded as much simply for being only "okay", but rather it garners such sympathies due to the fact it does indeed make actual strides at being forgiving itself. This is largely of note in the aspect that the film addresses learning disabilities and goes for this kind of understanding of the process needed by those that experience such difficulties as not being best served by the time-tested methods of traditional schooling. Despite some sections of the film resorting to the type of humor we typically see in such comedies-we get a whole sequence where the ragtag group of night school students break into the principal's office to try and swipe a copy of their exam that results in broken bones and barf gags-there are just as many sections that dedicate themselves to shining a light on these reasons people may fail in the classroom that have nothing to do with their level of effort, interest, or even outside factors that might influence, but instead are based in either psychological or developmental issues that can never be cured, but must instead be catered to. And so, while Night School isn't as funny as it should be it is an admirable endeavor for, at the very least, conveying this message of how much those who truly care and invest the time in our future generations actually have to care and how much time actually has to be poured into cultivating those who may not respond to the standard curriculum as effectively as they might to a different method. Of course, one could argue that given the film wasn't designed to be an inspiring drama or piece of insight into the education system, but rather a broad comedy that isn't all that funny that it fails more than it succeeds and they wouldn't be wrong. Still, Night School is so overwhelmingly positive in its message and is buoyed to such an extent by its charismatic ensemble that, while it may not remain memorable for long, will leave a smile on your face as you exit the theater. 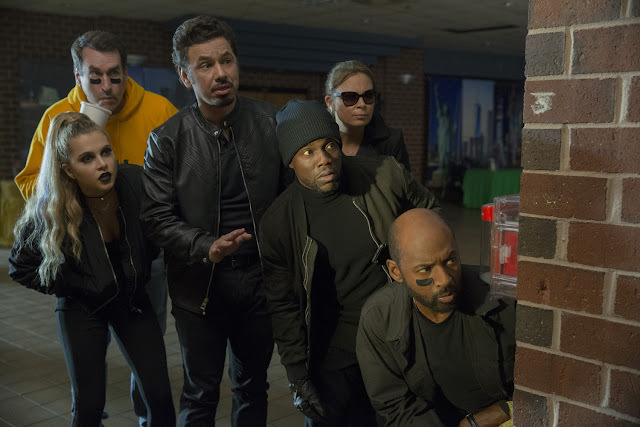 Mackenzie (Rob Riggle), Mila (Anne Winters), Luis (Al Madrigal), Theresa (Mary Lynn Rajskub), Teddy, and Jaylen (Romany Malco) in Night School. To the extent that it's kind-hearted, but not as funny as it should be that is likely all one needs to know in order to determine whether they might venture out to see this or not, but it is of note to offer a little further insight into what makes the strides that Night School does take in the right direction so compelling. This is largely due to the appeal of Haddish and while, if you saw her in her breakout Girls Trip role last summer, you'll know that she banked off being the loudmouth, crazy type that would go to any extent for a good laugh and while the lack of that mentality in Carrie is what may have led to a downturn in the number of overall laughs here it is because of Haddish's restraint along with the audience's knowledge of knowing she can level up if necessary that lends this whole scenario a more grounded foundation. Sure, Haddish is allowed to crazy every now and then-especially in those moments they've already over exposed in the trailers-but if Night School is good for nothing else it shows that Haddish can in fact bring more than one facet of her larger than life personality to the big screen and that's a plus as audiences will become much more familiar with the comedian over the next couple of months given she has two more feature films coming out that she is either the lead in or featured prominently. It would be easy for Haddish to experience a meteoric rise and burn out just as quick and it remains to be seen how well she and the people around her will navigate her career, but Night School at least shows us not only that there is more than one layer to the actress, but that she can play to those multiple layers effectively. So, if you're coming to the table for Haddish know that while she may not be as prominent a presence as the marketing would lead one to believe she still brings her A-game and displays a knack for gauging how best that presence can serve the material. Haddish's contributions largely assist in championing this message of empowerment that says that even if the path you follow to reach a goal isn't the same path most people use to reach that goal, it doesn't matter. Hart, on the other hand, delivers more of the same that audiences have come to expect from him. This isn't all bad news (I rather enjoyed The Wedding Ringer and About Last Night), but it does mean that if you're coming for Hart you know what you're going to get and what you expect is more or less what you receive. Night School is by no means a failure, but it probably should have hit the comedy books a bit harder.